I am so excited to share the details about my son's birthday party with you! It turned out so cute and was really fun for me to plan. There were a lot of fun details to the party so I'm going to break this up into a few posts. I first saw the idea for a Little Man Tea Party on So You Think You're Crafty. It was an entry from Cheri at I Am Momma Hear Me Roar. (Big fan of her blog!) You can find the full details for her party here. I knew the minute I saw the idea it was exactly what I wanted to do for the birthday party I had coming up. I know first birthdays don't need to be big, but I confess the party was more for my 3 year old than my baby! The first part I planned was the invitation. 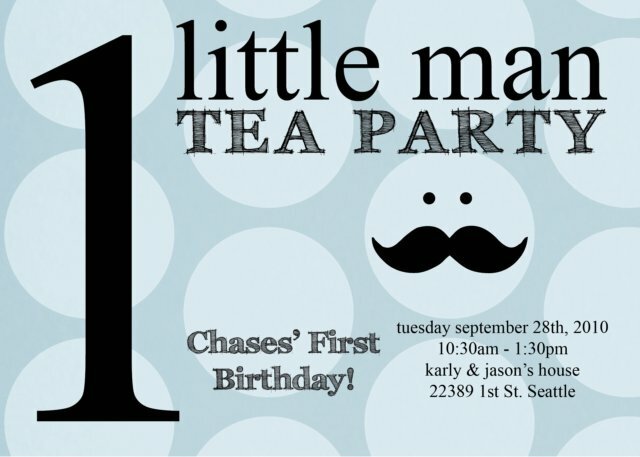 I was going to just put "Little Man Party" but I knew that a few girls would be invited, so for their sake I stuck with the original name of "Little Man Tea Party". This is the card I designed - a completely original design with all my own paper and elements even! I'm so pleased with how it turned out. I wanted it to be simple, but fun. I think it turned out perfect! Does the background paper look familiar? It's the same paper I used as a background for my blog! If anyone is interested in using this invitation for their Little Man Tea Party, feel free to contact me. I'd be willing to prepare the invitations for a good price!